Frazer offers 4 standard tax rates for all states. 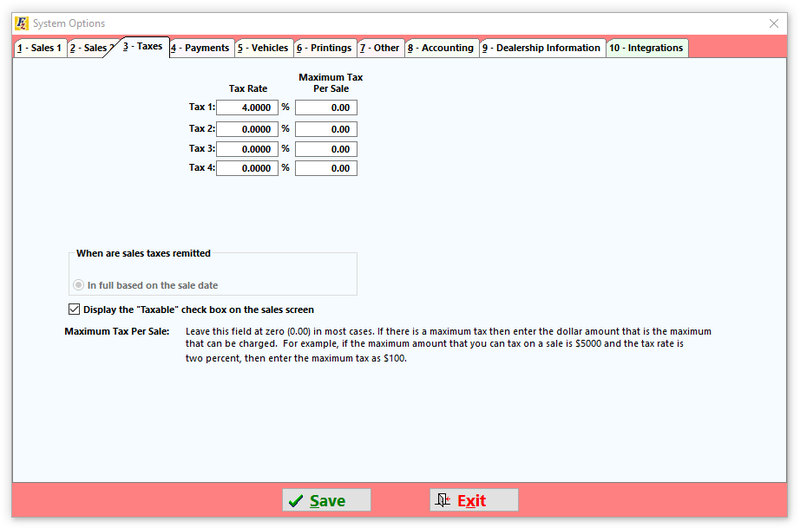 Tax 1 is typically used for the state tax rate. In most states, Frazer has set this to the known state tax rate, Tax 2 is typically County, Tax 3 is City, and Tax 4 is typically any other municipality. Some states like Alabama, Illinois, and others may have some of these specifically assigned for specific municipalities if Frazer is aware of them. In some states there may be a 5th option beneath these four if products like service contract are taxed at an alternate rate or there are fees like document stamps (FL) or inventory taxes (TX). In most cases, you'll never need to change this from it's current/default setting of 0. However, some states require you to set a maximum tax per sale. If you're in one of these states, you can add the maximums here. In some states, taxes for in-house finance sales can be paid either in full at the time of sale or as payments are collected. Selecting the correct option here ensures the Frazer system calculates payments, prints contracts, and reports the amount of sales tax due correctly. If you only complete in-state retail sales that would only be subject to standard taxes you can chose to remove the “Taxable” checkbox on the sales screen so that all sales have normal taxes applied. If there are times when your customers do not get charged sales tax at the time of sale, checking the box will allow you to turn off the tax rates for that specific sale.